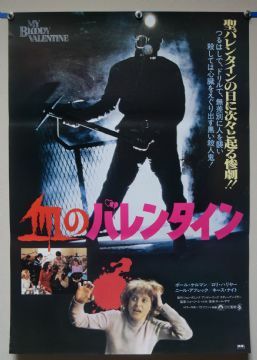 My Bloody Valentine (CDFC,1981) Japanese B2 Film Poster 28.5" x 20.5"
Starring Paul Kelman, Lori Hallier and Neil Affleck. A decades-old folk tale surrounding a deranged murderer killing those who celebrate Valentine's Day turns out to be true to legend when a group defies the killer's order and people start turning up dead. The poster has a couple of tiny light surface creases on the right hand side. Displays very well.